This is a belated post, which I began composing almost two weeks ago. I’ve been having issues accessing my site, which contributed to my general tendency to draw things out when it comes to finishing writing. I described my work plans for “A Portrait of a Collecting Strength” in a previous post. The second installment should arrive sooner than this one (like, tomorrow, or early next week). The EAD file for a finding aid. The network graph data for my project is generated from a selection of Rose Library finding aids related to twentieth-century African American writers and artists. 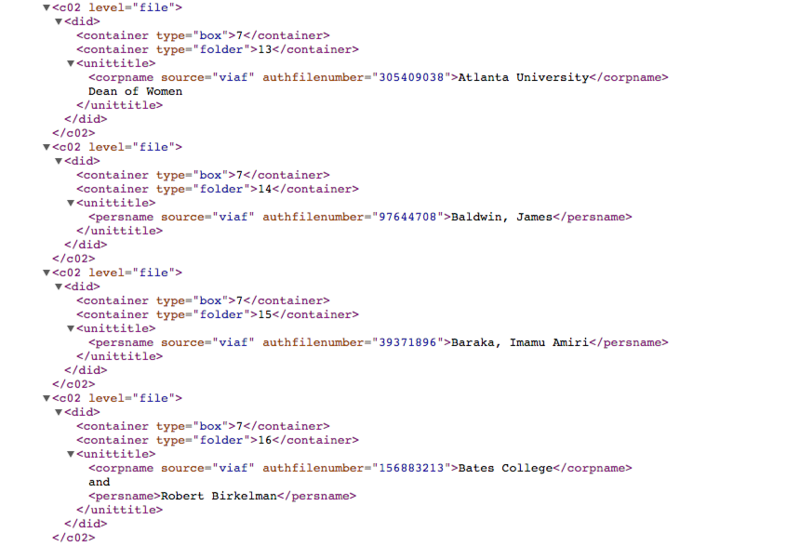 In each relevant finding aid, we tag people, organizations, titles, and places, and add unique identifiers to generate machine-readable linked open data. (Graduate student assistant Ashley Eckhardt has been assisting me with this step.) Then, that data is exported to create the network graphs. Each node in the network represents a collection, person, title, organization, or place that is named in the finding aids. The lines (or edges) between the nodes indicate a relationship between nodes: corresponded with, is part of [a collection], et cetera. For instance: Langston Hughes corresponded with Louise Thompson Patterson. Or, the manuscript of “Mother and Child” is part of Thyra Edwards’ Langston Hughes collection. The way archivists process and describe collections therefore greatly impacts the shape of the network graphs. For instance, if correspondence is sorted by year, rather than name, the finding aid will likely have many fewer connections among people compared to finding aids that list each correspondent. Archivists may decide how to describe a correspondence series by weighing the size of the collection, the perceived public and internal institutional interest in the collection, the perceived prominence of correspondents, and/or archival best practices of the moment, such as More Product Less Process (or MPLP). My reading and conversations in coming months will explore the (professional, institutional, cultural) dynamics that shape a finding aid. In the early 2000s a number of archivists wrote articles analyzing the use and finding aids as texts. For instance, “Colophons and Annotations: New Directions for the Finding Aid” (2002), by Michelle Light and Tom Hyry, argues that finding aids should adopt the scribal convention of a colophon, to insert information about the processor’s interventions as they arranged and described the collection. A colophon typically appears at the conclusion of the text, and comments upon the conditions of production. Light and Hyry put forth that archivists play an analagous role to scribes or printers as they “shape and mold collections” (223). The finding aid colophon would provide space for archivists to “acknowledge and explain their impact on the transmission and representation of a collection,” including arrangement and deaccessioning decisions, and would be accessible to researchers (224). In their conclusions, Light and Hyry advocate for colophons and annotations, because they would “force researchers to acknowledge the value we add to collections and spark more dialogue between the keepers and users of archives, which will in turn lead to greater understanding of the historical record” (229). They describe this task as a part of their “responsibility and role in the transmittal of culture and social memory” (229). Yakel, like Light and Hyry, is interested in how finding aids or other representations of archives could adapt to the changing meaning and uses of collections as archivists and researchers interact with them. Yakel states, “The structuring of representational practices by creators, archivists, and systems enables or inhibits the meanings of representations as they cross boundaries of space (creator to archives), time, and use” (24). In all of these discussions, the authors attempt to account for the role of archivist in making the archival collection. Wendy Duff and Verne Harris, in “Stories and Names: Archival Description as Narrating Records and Constructing Meanings” (2002), grapple with issues of bias and complicity, particularly around questions of marginalized voices. They raise questions such as “Can the mainstream ever accurately represent the marginal?” (278). They propose “a liberatory descriptive standard would not seek to hide the movements of its construction” (281). Such a standard would “as far as possible, make known the biases of its creators” and “[encourage] the documentation of continuing archival intervention” (281). This moment in archival theory from over a decade ago helps me to contextualize my own thinking about finding aids and the limitations of using finding aids as the source for the network graph data. These readings also lead me to understand how my project–which might contribute an archival representation that attempts to document archival interventions and biases–is in conversation with these threads in archival theory and practice. The methodology for my project relies on the methodology developed by Rebecca Sutton Koeser, Elizabeth Russey Roke, and Brian Croxall for Belfast Poetry Group | Networks. That project launched last year, and the graphs and accompanying essays demonstrate the uses and limits of working with finding aid data. My project draws upon a larger number of collections, and because I’m interested in asking questions about the collections themselves (in addition to what the collections may tell us about the history of a group of artists), I am tagging more of each finding aid. Belfast Group Poetry | Networks illustrated the interpersonal connections apparent in the papers of Seamus Heaney, Ciaran Carson, and other Northern Irish poets. “A Portrait of a Collecting Strength” considers similar kinds of connections among the Rose Library’s African American collections, while also taking the collections themselves as objects of enquiry. I expect that “A Portrait of a Collecting Strength” will present not only a new way to explore and access the collections, but will also raise (and at least begin answer) questions about the routes that collections took to reach Emory, and the impact of archivists’ description upon the way we understand, discover, and access collections. Sticking to plan to work for a two-hour block each day has been challenging. I had a productive day or two where I stuck to the schedule and wrote, including writing a proposal for what I expect to need to complete the project, and what I expect done will look like. But then, not having found a lot of time to read things that I wanted to write about, I decided to amend my plan to allow for reading during the two-hour block too. But then there were meetings and reading room shifts; a sick day; an early closing for “snow” day (it was raining. Atlanta handles weather poorly). I made progress, but I didn’t always stay focused. In the next two weeks, I’m going to block out the two writing hours on my work calendar. * I’ll still allow for some reading, but will have to write at least a half an hour at the end. When stuck, or get sucked into social media/email checking, I’ll hide all windows and close apps, and take a one minute pause to just look at the doc or reading and/or zone out. When office spaces are busy/loud, I’ll relocate to the stacks (in the midst of writing this sentence someone stopped by and I got distracted…). *At the time of publishing, I can report this has been a successful strategy. In the next weeks, I’m focusing on the history of African American archives and collections. The edited volume Black Bibliophiles and Collectors is on my desk and I’ve begun to read it. I have a biography of Schomburg checked out, and the recording of the livestream of Monday’s celebration of Arturo Schomburg at the Schomburg Center ready to watch. I’ll continue to read from the current Social Text issue, The Question of Recovery: Slavery, Freedom, and the Archive. I’ll also begin to set up interviews with colleagues at Rose. **At the time of publishing, the second two-week period ends tomorrow.